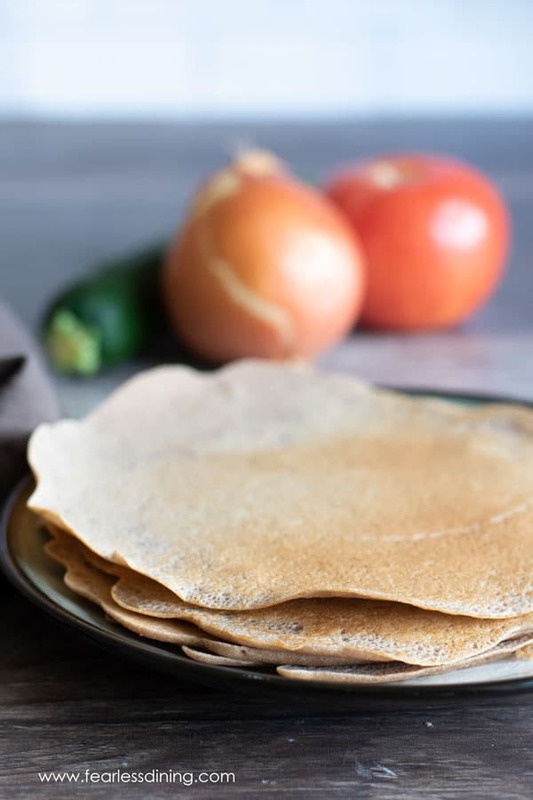 You are going to LOVE these instructions on how to make gluten free savory crepes right in your kitchen! Often when you hear of a crepe, you immediately think of something that is sweet and filled with sugary jam. Well, those heavenly crepes do exist, but you can actually do so much more than making a dessert with them! 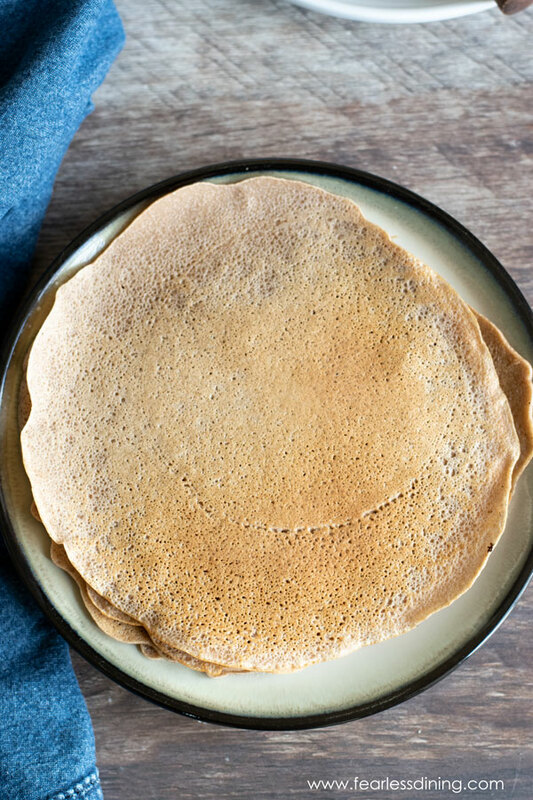 The first time you taste any savory crepe filling you are going to be shocked by how delicious teff crepes are and wonder why you haven’t eaten this all along! The options are seriously endless when it comes to making savory crepes. 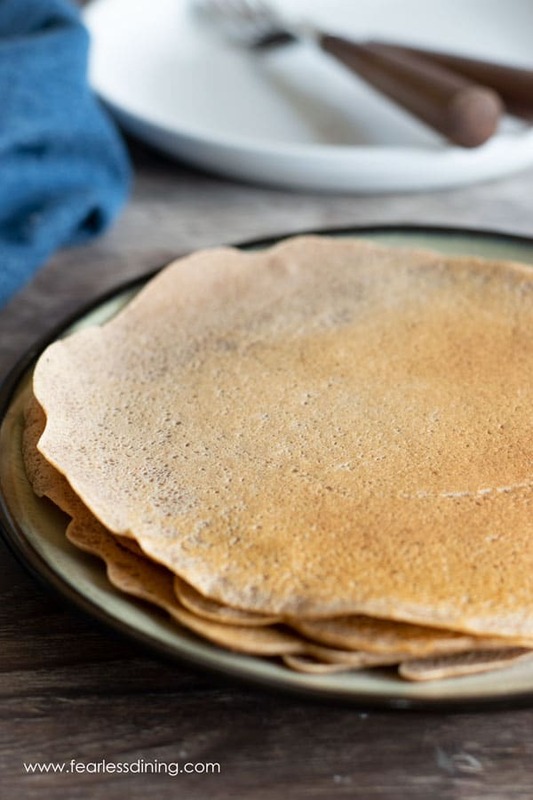 Just in case you are craving sweet crepes, you will want to make this Gluten Free Crepes recipe. When I tell my family we are eating crepes for dinner, everyone gets excited. My favorite part is that they are super easy, delicious and versatile. I still remember making my first batch of crepes at home, and we had just become gluten free. I was worried I wouldn’t get them to turn out, but they were a massive success! My kids even helped me cook them. Now dinner crepes happen frequently at our house. If you are still new to gluten free dining, then you should take a look at my guideHow To Eat Gluten Free Anywhere + Best Gluten Free Diet Tips. I know that there is a learning curve and I always am willing to help. If you have questions, I would love to hear them. Plus, I would also enjoy seeing photos of your savory crepes! Pulled Pork – My mouth is watering as I think of the last time I had pulled pork in a crepe! You should really give this a try because it won’t disappoint. Curried Chicken Pot Pie – Take the filling for this curried chicken pot pie recipe and add it to the middle of the crepe. Holy yum! You are going to be hooked! Alfredo Sauce – Putting this homemade alfredo sauce with sauteed veggies is a home run! I like to drizzle a little extra sauce on top before I eat it too. Vegetables – Saute any veggies you wish like mushrooms, onions, peppers, or tomatoes. Sometimes I even add in some minced garlic too. If you aren’t familiar with teff, you might be wondering what in the world it is. Teff grains are ground into flour. 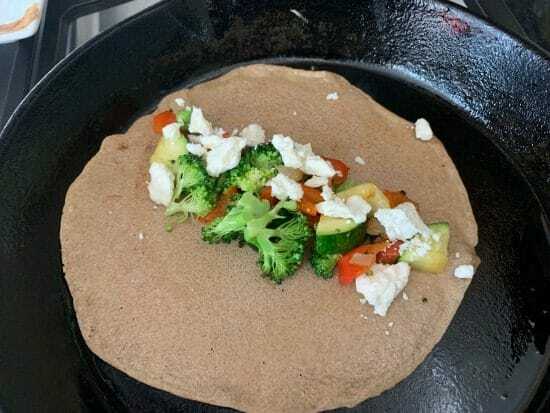 It is naturally gluten free and frequently used in Ethiopia to make a traditional dish called Injera that is very similar to a crepe. You will probably be surprised to find out that teff is loaded with protein, and is high in fiber. It also has manganese, calcium, and iron, so it is packed with healthy nutrients. If you are excited to try teff, this Teff Cheese Grits Breakfast is a great place to start! When Is The Best Time To Serve Gluten Free Savory Crepes? Guess what, you can serve gluten free savory crepes any time! They are scrumptious for breakfast, lunch or dinner. One of our most adored ways to eat them is for breakfast. We don’t always want something sweet and savory crepes really hit the spot. The best part is that they keep you full without being heavy in your stomach. Serve your favorite savory crepe recipe for dinner parties, brunch, baby or bridal showers and everyone is going to have happy taste buds! There isn’t a wrong time to serve a gluten free crepe if you ask me. Can I Make Savory Crepes Ahead? Yes, absolutely you can make crepes ahead. I like to make them and freeze them, so I always have them on hand when I am super busy. Whether you freeze or refrigerate the crepes, place them in layers with wax paper between each one and store in freezer bags. That way they don’t stick together, and you can quickly grab whatever you need. To reheat, place on a microwavable plate and heat for 15 seconds until warm. Never overheat the savory crepes, or they will become stiff and not very pliable. **Tip: Whenever you freeze crepes, it is best to flash freeze them before placing them in the freezer bags. To flash freeze, merely lay the crepes out on a large cookie dish and place in the freezer for 1-2 hours until they are solid. 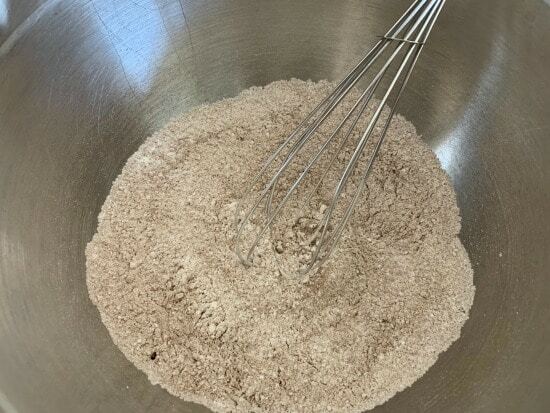 Add the dry ingredients to a large bowl and whisk to blend. In a smaller bowl and whisk to blend until frothy. Pour the wet ingredients into the dry ingredients and mix well. Pour a ladle full of crepe batter into a skillet. 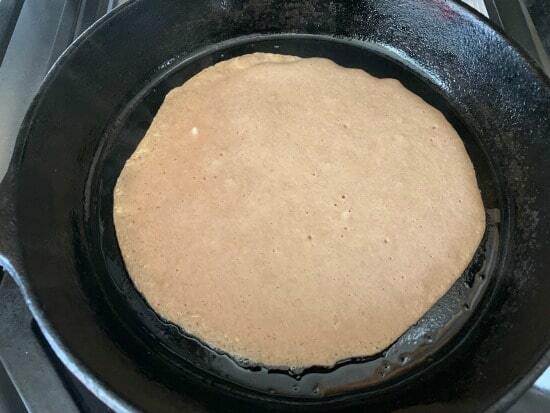 Quickly tilt the pan in a circular fashion to spread the crepe batter to cover the bottom of the pan. Cook until the crepe is bubbly. 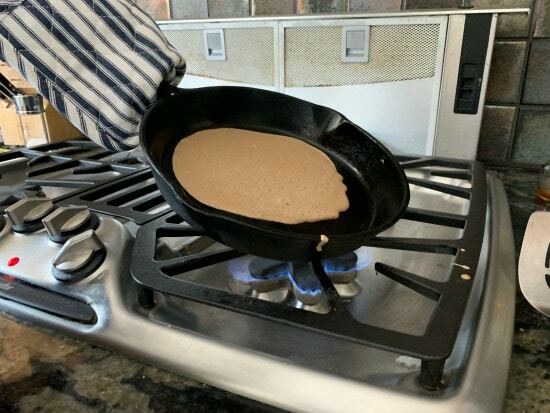 Flip the gluten free teff crepe so the other side cooks. Add your favorite fillings. I added sautéd vegetables and feta cheese. You can add scrambled eggs and make these breakfast crepes too! 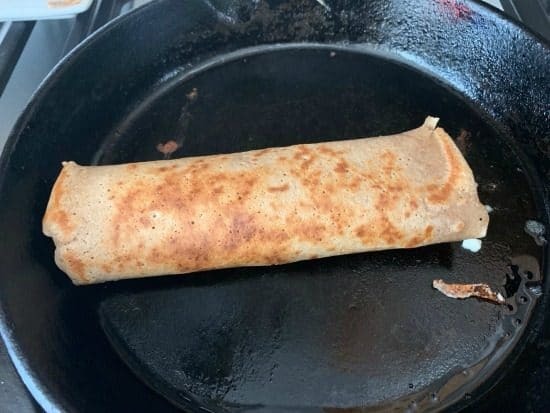 Roll the crepe and enjoy hot while the cheese is melty! A cast iron skillet or crepe pan. In a medium bowl, add the wet ingredients and whisk to blend. Pre-heat a cast iron skillet on medium heat. Add oil to the pan. Use a soup ladle to pour batter into the hot pan. 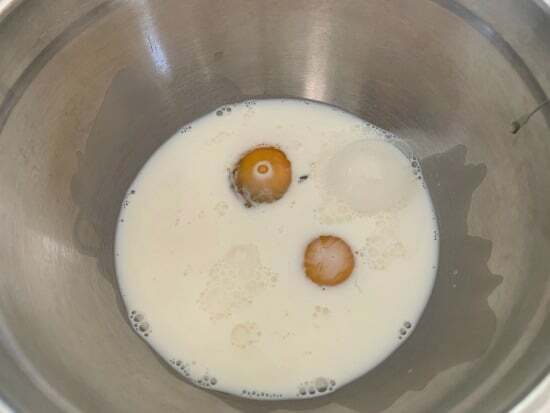 Quickly hold the handle and tilt the pan in a circular fashion to spread the batter thinly over the bottom of the pan. Cook until you see bubbles in the batter. Use a spatula to flip the crepe and cook the other side. Add your favorite fillings and enjoy! Mixed these up in my vitamin and got a thick, creamy batter that spreads well with the back of a spoon. These crepes can hold up to sweet or savory. We’ve eaten them both ways. When I do savory I put a bit of pepper and garlic powder into the flours before mixing. 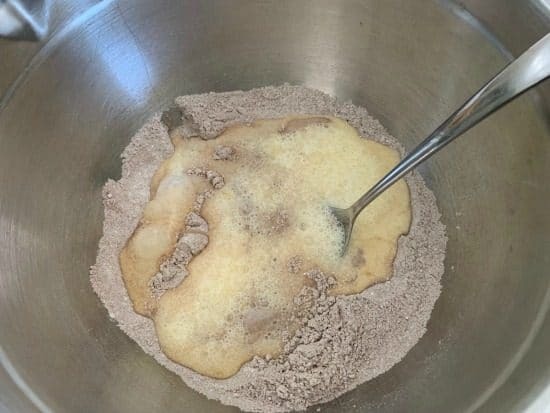 When sweet, a 1/2 tsp vanilla and sometimes cinnamon. These look delicious! Have you ever tried them with a flax egg? I would like to try to make them vegan. I haven’t tried this recipe with a flax egg, but now I am intrigued! Wish I found your recipe sooner. I just tried last week to make gf and dairy free crepes last week and failed. Can’t wait to try again with your recipe. We love making crepes and putting eggs and other topping inside! Love that you made these savory. You usually see sweet crepes out there, but this would be perfect for dinner or even a yummy brunch. 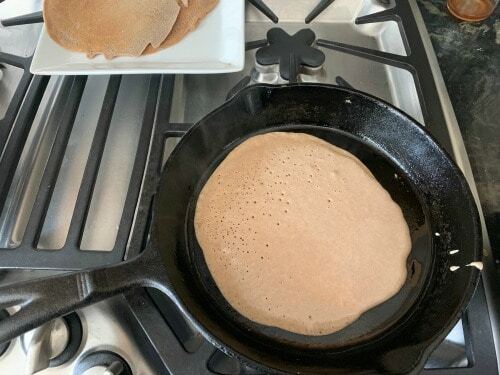 I really like the use of teff flour here instead of buckwheat – so often buckwheat is used in pancakes and other gf breakfast foods. Have you experimented with a vegan option for the egg, like a flax egg? I’d love to try it! Thanks. Hi Dreena, I haven’t tried it with an egg substitute, but I am pretty sure it would work perfectly. Please do come back and let us know how it turns out.